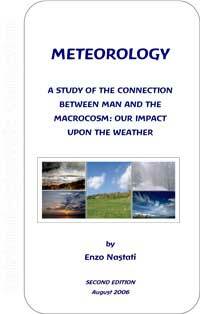 METEOROLOGY A study of the relationship between man and the macrocosm: our impact on the weather 1) Foreword Today we are facing a serious dilemma: on one hand we are witnessing the slow but progressive weakening of the laws that govern the weather, and on the other we can not understand these laws through scientific methods. As far as modern meteorology is concerned modern scientists cannot clarify the laws sufficiently to predict the events that make up our weather. This publication is intended as a first attempt to come closer to these laws by taking advantage of the knowledge that comes from anthroposophical spiritual science. The first aspects to understand are those of the spirit and soul. This may seem strange to current scientific thinking, but we might simply consider how we describe the ever-changing weather in soul/moral terms such as "beautiful", "ugly", "good", "bad", "dull", etc. ie characterisations that are typical for living and ensouled beings, that might lead us to recognize, through the genius of the language, that people see - or saw - the influence of soul/spiritual entities reflected within it.